It's a bird! It's a plane! It's somewhere in between! 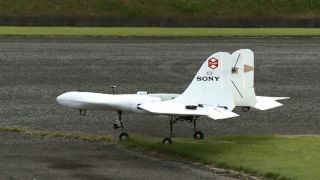 Sony recently announced it had joined forces with Tokyo robotics firm ZMP to develop commercial drones, forming a new coalition named Aerosense. The relationship is already bearing fruits, the first of which we've glimpsed in a new video. Footage of the first Aerosense prototype has surfaced. Looking at the DTO1-E's plane-like design, you'd expect it to take off as such. But no, you'd be wrong - this thing takes off vertically. The drone will be capable of carrying 22 pounds of weight and will fly at around 106 miles per hour. However, it doesn't sound like this will be a drone Sony will be selling to you or I. Rather, it will be used for surveying infrastructure and difficult-to-reach places. There's actually footage of a second prototype, a quadcopter that's smaller and goes by the name of AS-MMCO1-P. It comes with a camera and GPS on board, but doesn't look a world apart from the drones we're used to seeing. Watch it doing its thing below.